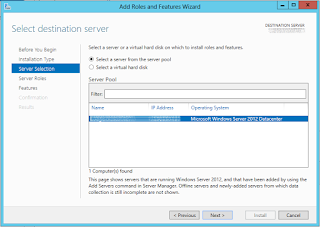 One of my favorite additions to Windows Server for the 2012 version is application level load balancing and fail-over. This all new implementation does away with the previous solutions: "scope-splitting" and Windows clustering, neither of which I have ever felt comfortable recommending to a client. Splitting scopes doesn't do enough to prevent outages, and clustering is too complex to be a DHCP solution. A single implementation can have two servers, no more. 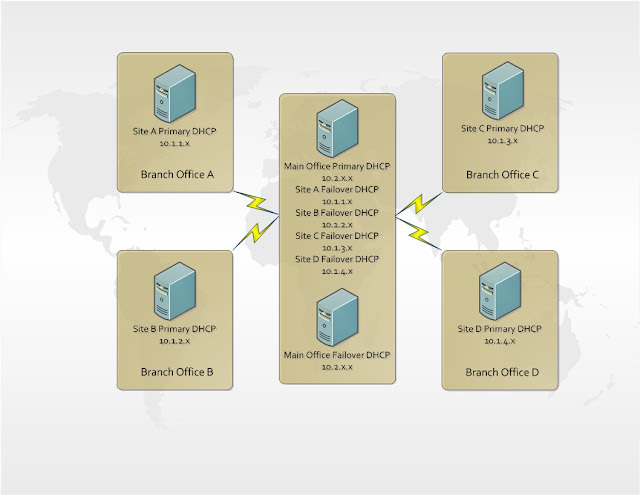 Servers can be configured in load-balancing or hot standby mode. The load balancing strategy splits client servicing based off of a MAC address hashing algorithm and will still respond to client requests that the other member in the pair should service in a situation where the client has gone unanswered. Provided you're using a datacenter licensing model and virtualization, most folks will want to utilize load balancing with two DHCP servers per site, generally on different hosts connected to different switches. If needed, load distribution mechanisms like F5s will work with this tech. 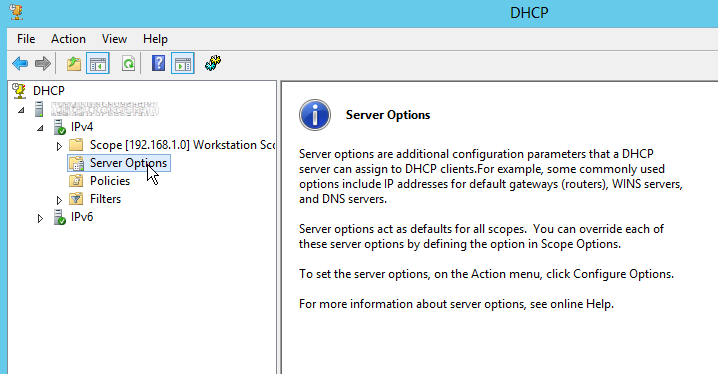 Since we need to set up at least two servers, we'll do this twice, once with the GUI and once with Powershell. 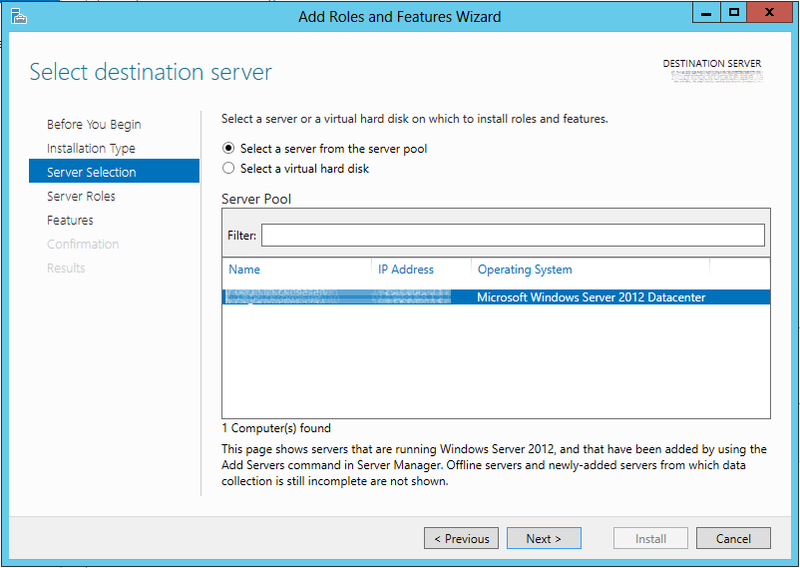 After bypassing the intro screen, select "Role Based or Feature Based Installation" and select your server. 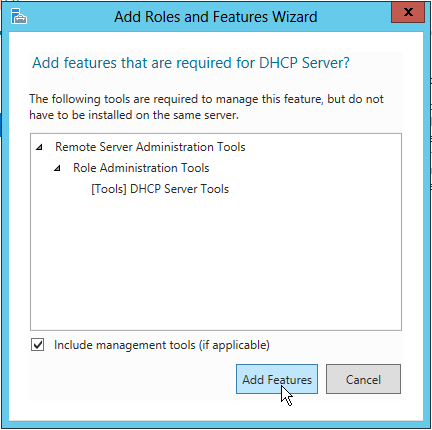 Select the "DHCP Server" role. Admin tools will be auto-selected as needed. Click "Next" through the rest of the Wizard. 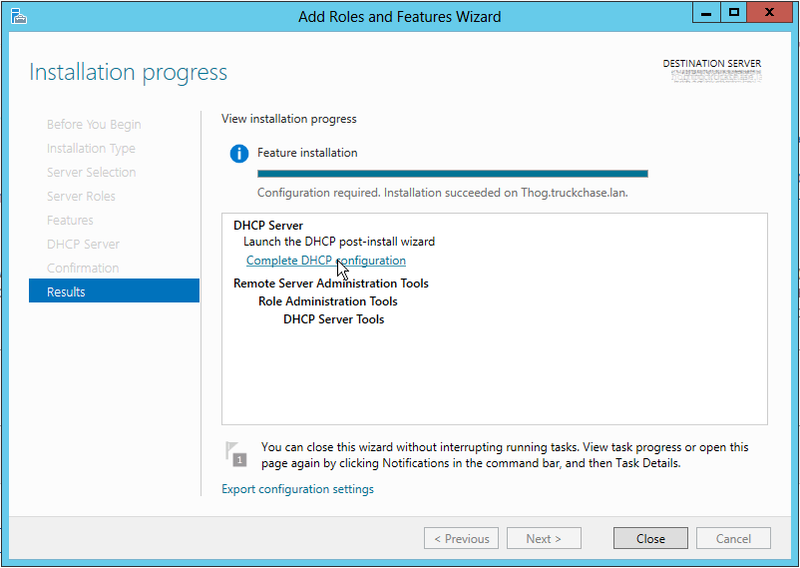 Once it completes, you'll be notified that DHCP configuration needs to be completed. 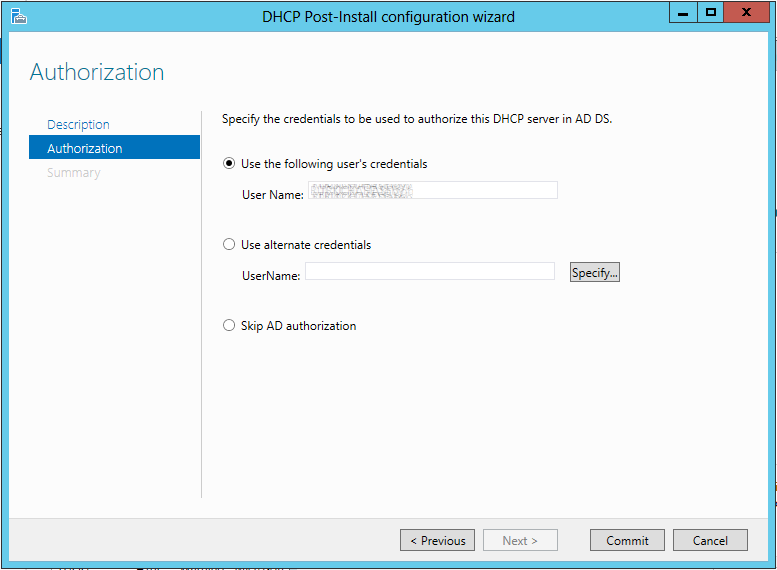 Launch the DHCP Post-Install configuration wizard and complete the DHCP setup by authorizing the DHCP server. Note that in step #3 you must specify the -ipaddress parameter (i.e. -ipaddress 10.0.0.10) if your server has either multiple NICs or has messed up registration in DNS. See here for more info. 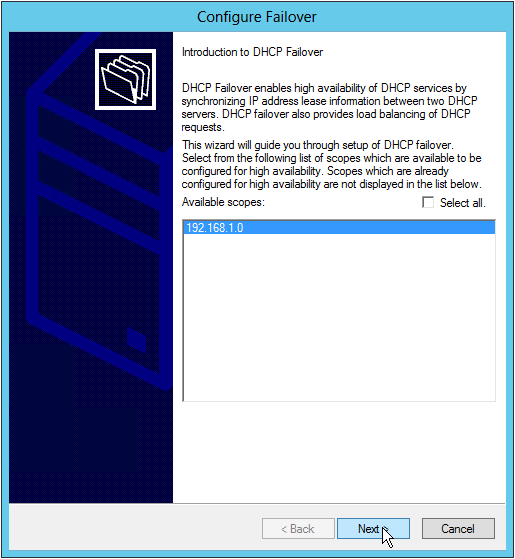 Open up the DHCP management GUI and right click on the scope you would like to load balance and select "Configure Failover..."
On the "Introduction to DHCP Failover" screen, select all scopes you would like to configure (or "Select all" for all) and click "Next". 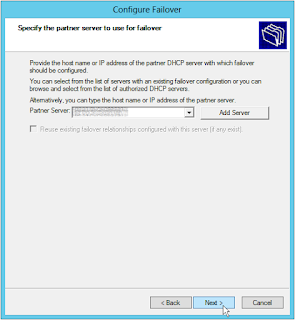 On the "Specify the partner server to use for failover" screen select the other DHCP server. This can be looked up provided the server has been registered in Active Directory. Relationship name: Configure a name for this partnership; you may want to manipulate this via Powershell so take that into account when considering a very complex name. 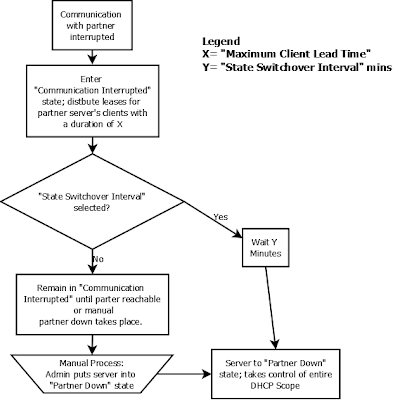 Maximum Client Lead Time: This determines two three things: A) The lease time for a new client request if the server responsible for that client is down and the other answers the request and B) The amount of time one server will wait for a dead partner server before it takes control of the entire IP address block. C) (added 8/5/13) The amount of time one server that had been down must be available to the other before "Partner Down" status will automatically be changed to "Normal" status. (See comments for an example of this) The default of 1 hour is generally good but you may want to tweak depending on your setup. Mode= Load Balance / Load Balance Percentage: This determines how much of the total load each server will take. Mode= Hot Standby / Role of Partner Server/Addresses reserved for standby server: This determines if the partner sever is the primary or the standby and how much of each scope is reserved for distribution should the primary go down. Be careful that you have enough reserved here so that you won't run out of IP addresses prior to switching to "Partner Down" mode while also ensuring you won't run out of IPs on the primary server due to reserved addresses on the standby. 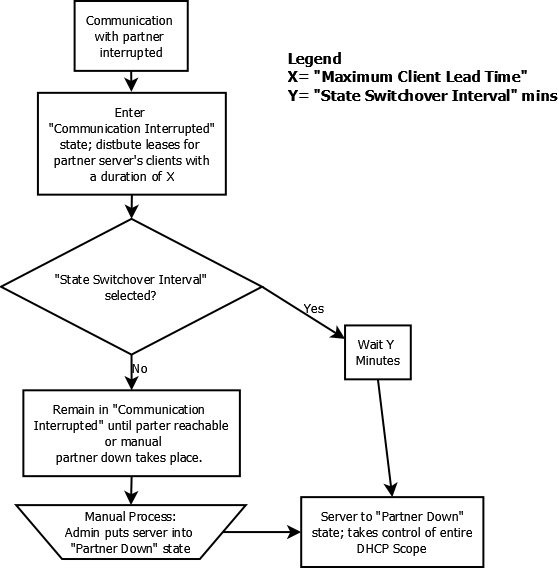 State Switchover Interval: Selecting this enables either server to enter "Partner Down" state should communication be interrupted for the number of minutes specified after the option (default 60) resulting in the remaining server taking full responsibility for the scope(s). If this is not selected, an admin must manually choose to put the server into partner down state. Enable Message Authentication and Shared Secret: I highly recommend checking this box and specifying a long (14+ character) shared secret. This will encrypt messages between the two servers by using SHA-256. Should you wish to change the crypto, navigate to "HKEY_LOCAL_MACHINE\SYSTEM\CurrentControlSet\Services\DHCPServer\Parameters\" in the registry and add/change "FailoverCryptoAlgorithm". 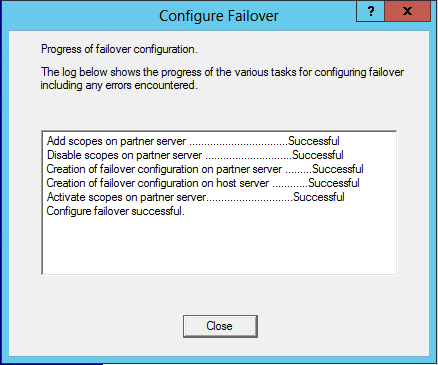 You'll then be met with a failover summary screen. Verify the info and click "Finish". 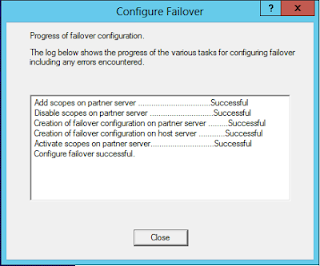 You will be shown the failover setup process. 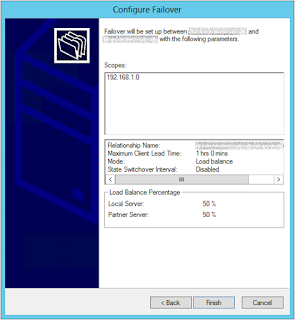 -StateSwitchInterval = Int; specifies how long to wait until auto transition to Partner Down. Makes AutoStateTransition assumed to be true. Server Options are NOT replicated! Take this into account when setting up replication; you may want to specify options at a scope level so that if they are changed you don't need to manually do it on each server. There have been some reports of replication breaking custom options. See here for more info. Thanks for taking the time to read; should you have any questions leave them in the comments! 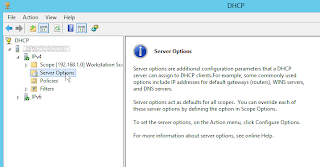 Hi Toby, thanks for our article, written much better than MS. One question, once a DHCP server enter the partner down state and the other server take over, when the down partner comes back up, will the two DHCP servers go back to 50/50 automatically? There is some conflicting information in the documentation out there, so to confirm the answer I ran a few tests. The tests revealed that the Maximum Client Lead Time also corresponds to the automatic fail-back period. When one partner enters PartnerDown state, it will stay in that state until the other server has come back up and then the maximum client lead time has elapsed. This holds true regardless of if the transition to PartnerDown state is automated (via State Switchover Interval) or manual. - Server 1 is manually transitioned from "Communication Interrupted" state to "Partner Down" state @ 1:05. - Server 1 & 2 will automatically transition to "Normal" state @ 2:10. Be careful if lowering it though, remember that this value also configures lease duration when in communication interrupted state; one would not want to flood the remaining DHCP server with DHCP renewal requests due to the temporary lease time being too short. I'll update the main article with this information. Thanks for the great question! How it works in a multi-scope environment (multiple networks)? 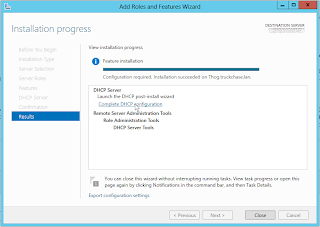 Do you know if the DHCP Relay parameter can be used in this type of configuration mode? Absolutely; you can replicate all scopes on your server should you desire. 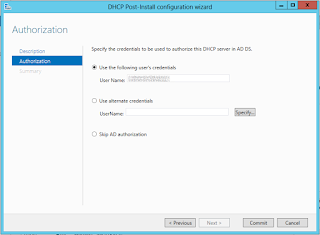 Things get a bit trickier using DHCP relay agents on your routers/switches however. For full fault tolerance your routers/switches must support either DHCP broadcast relay to the target subnet or support multiple IP addresses for the DHCP relay target. I know most new Cisco devices do the latter with just a couple commands. I've also tested F5 big-IP as a solution successfully in a Primary/Standby configuration using standard TMOS failover functionality. If you can't facilitate any of the above, be aware you will have to change the target IP on your relay agents should the "primary" fail. 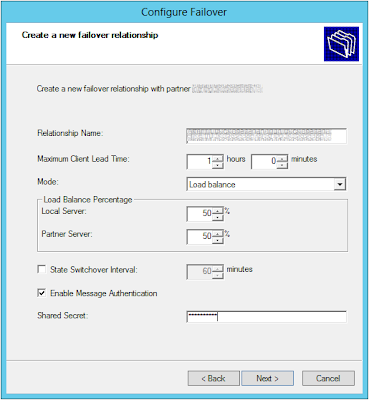 Also note you can have multiple failover relationships but no more than two servers in any given set of relationships. You can have as many scopes as you want in any given failover relationship. If you have any other questions please post them up. Thanks for reading!